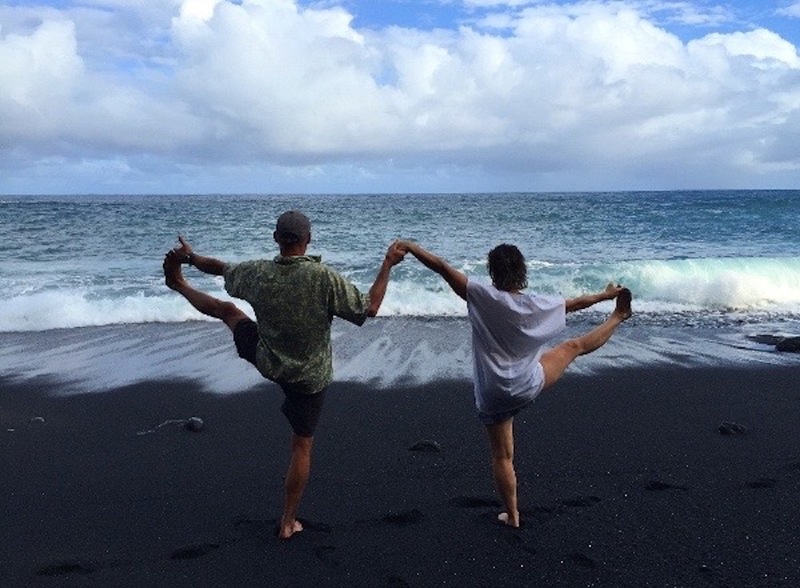 Immerse yourself in the nurturing practices of yoga, art making, island adventuring, and healthy eating during a blissful week in Hawaii! 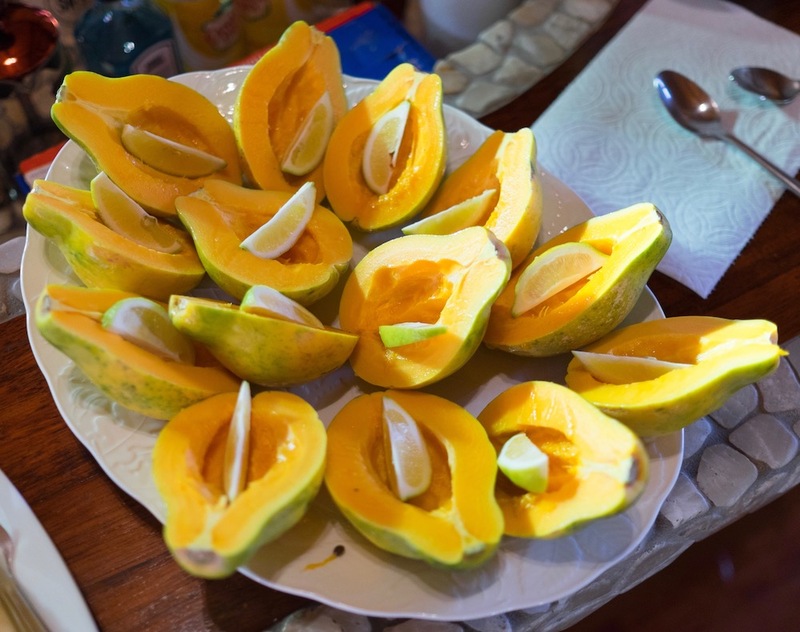 Quieter pursuits of watercolor painting, meditation, pranayama, and restorative yoga will balance more vigorous activities of vinyasa yoga, hiking, swimming, and snorkeling. Each retreat is limited to 12 participants, and all levels of yoga and art experience are invited! Spring flora in the foothills of the Sierra Nevada will inspire a series of design, drawing, and painting projects using watercolor and gouache. On gentle forays outdoors, we’ll collect ideas and subjects, and experiment with step-by-step painting techniques. Processes will include user-friendly approaches for color mixing, creating repeating surface patterns, capturing gesture, form, detail, light and shadow, and painting in layers. You’ll also create a decorated folio to hold your work for future reference and inspiration. Painting with watercolors in wild places generates powerful alchemies for revealing nature’s beauty and complexity. This course will provide clear in-depth instruction on the technologies and magical properties of watercolors and gouache, and how to use this knowledge to paint outdoors with more ease and confidence. Sequential studies, focused on summer flora, will demystify the watercolor process and provide future resource and inspiration. We can deepen our creative process by combining meditation and painting. 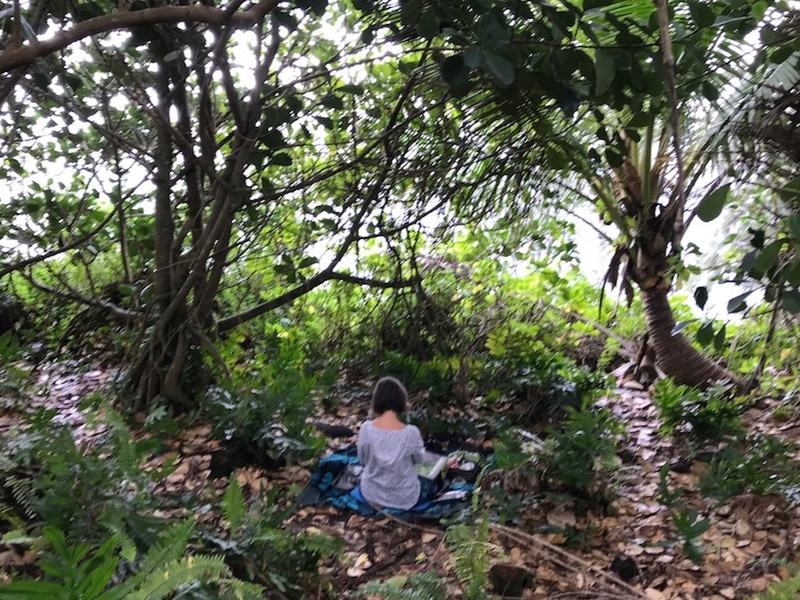 Guided practices will explore ways to quiet the mind as we weave ourselves into the forests of TreeSong through art making. 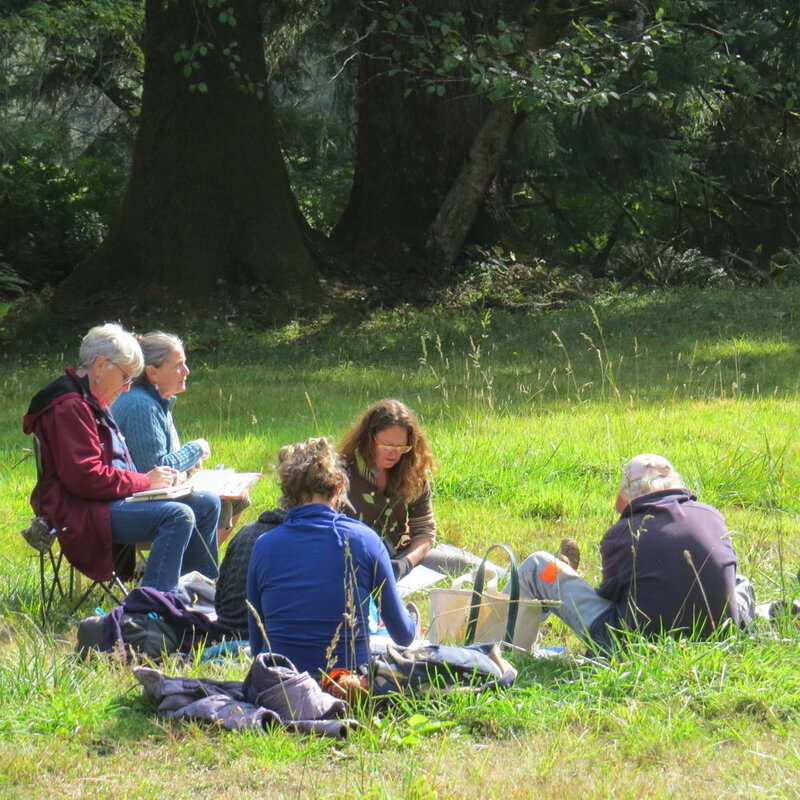 During gentle forays under the trees, we’ll make marks, find objects, glean ideas, and create a collection of experimental mixed media drawings and paintings. Best for those with prior painting experience. Careful observation of autumn flora will inspire a series of drawing and design studies using pencil, pen, and ink. The instructor will cover field-friendly ways to explore line, gesture, shape, texture, positive/negative space, detail, and composition possibilities. Our work will expand your drawing and design skills, and deepen your creative process. You'll end the day with an inspiring collection of field sketches to work with in Sunday’s class and for future reference! Autumn flora will inspire a series of shimmering studies using watercolor and gouache. Demos and step-by-step exercises will explore painting wet into wet, glazing wet over dry, and using gouache to build layers of shape and color, add detail, and re-introduce light over dark. Building on Saturday’s drawings, you’ll learn effective techniques to evoke beauty and complexity while paintings outdoors. Our work will evoke fall’s magic and inspire future painting. Saturday’s drawing class or previous field sketching experience is helpful. Painting in wild places is powerfully transforming, yet working outdoors can be overwhelming. A series of guided studies designed to get us working with ease will focus on autumn flora, with a particular emphasis on fall's color palette. During gentle forays outdoors and inside the studio, we'll carefully observe local plant life, collect ideas, and experiment with drawing and painting techniques using watercolor, gouache, and ink. All levels are invited. Andie works privately with a limited number of students each year. Individual mentoring empowers each artist to work at a deeper level by removing stumbling blocks and identifying techniques, tools, processes, and professional practices that can launch your art from the imagined to the real. I have been teaching adults and children since 1990 in a wide range of art processes, including watercolor painting, color theory, book arts, drawing, design fundamentals, field journal practices, and private creativity mentoring. 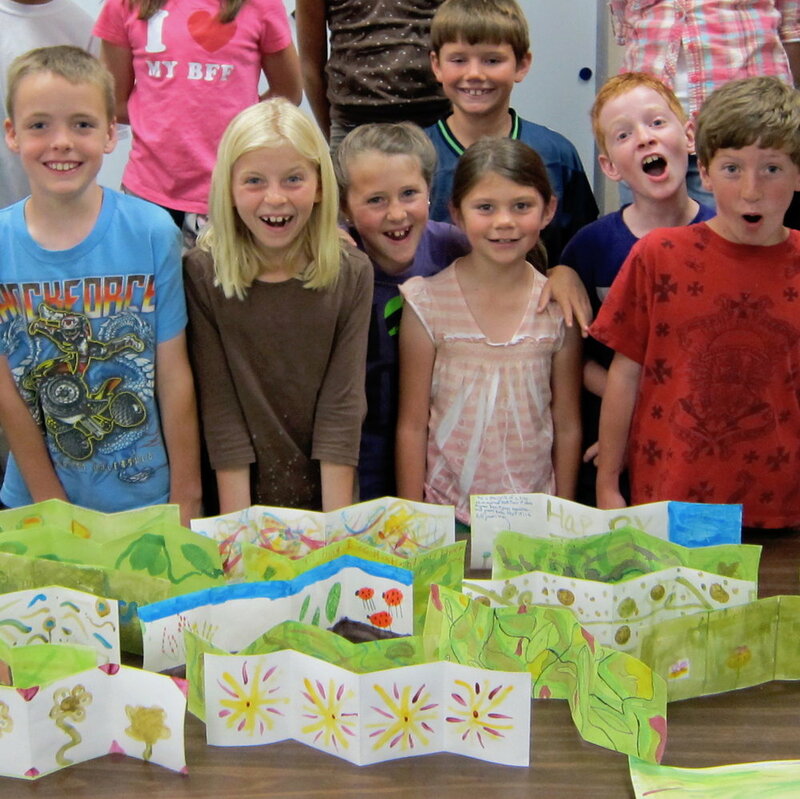 Most classes involve artmaking in the outdoors, and all classes emphasize empowering the individual to bring her own unique creative vision to light. I am a believer in ART. I believe that when we are open to our own creative depths and to the wild world all around us, magic & healing can happen. My teaching is about reconnecting to the big wild world we share through art making. I truly believe this can heal the world…. and more than ever before, Earth needs our healing energies. All skill levels are invited to my classes, unless noted otherwise. Age requirement is typically 12 and up. I want to thank you for reminding me that when we approach the natural world, we can look, and look again, and again… and there is no limit to how deeply we can go in our gaze, no limit to what is communicated. “To see the world in a grain of sand,” as William Blake would say. When I first realized we would be using that viola all day, I thought “All day? On one flower? Yikes!” However, by the end of the day, I was in such intimate communion with that viola, I wanted to take her home and have her for a friend! Oh, Andie, we had a marvellous time! …It is rare when an event that you have been anticipating lives up to your expectations but this weekend exceeded our expectations in every way. What a wonderful teacher you are—your gentleness allows for us students to be open and curious and energized—not the usual stress… Your presentations are very rich. I can’t tell you enough how very much I enjoyed my two days under your expert tutelage and with a group that seemed to me to be quite willing to absorb the spirit of the day. I came away very inspired to do more in this medium, and will try to paint additional subjects both in the studio and—if I get brave—outdoors. I feel that I learned a lot of the basics that I had lacked up until now, and that gives me confidence to press on to do more. You can take pleasure in the fact that you are a very good teacher. Again, thanks. I want to tell you what an incredible influence you have been on me; helping me to be where I’ve always wanted to be: ways of both being in the forest and all of the natural world, and expressing it. I have grown enormously this year from being in your workshops. You have opened doors for me that I did not even know existed, that have made my world larger and more rewarding than I could have known. I very much appreciated the way you extended respect to your students and also opened up a variety of ways of working, shifting emphasis back and forth from close observation to the expressive/energetic, to the symbolic and decorative. Thank you for being so supportive & enthusiastic about my little painting & card. It was fun. And it’s fun to find something that gives me pleasure instead of it feeling intimidating, which is SO much because of what a great teacher you are – making art feel accessible to complete novices. That’s a huge gift that you have, I hope you realize. Imagine yourself lighting this spark in every person you teach – a spark that can unleash creative energy in people who didn’t know they could express themselves with a brush. And that creative energy is so significant in terms of each person’s self-realization. I just wanted to tell you what your class touched off for me. I have been keeping the journal since then, and it has been a wonderful experience. It serves as just a place to record what I am seeing, a place to meditate, a place to work out artistic ideas that are not yet ready for prime time, and it keeps me connected to myself. The journal has also taken a lot of anxiety out of the process of making art…. But you also really managed to convince me that there was no right and wrong and this has made me feel somewhat fearless and much more secure artistically, secure enough to make art. I learned so much about color and even worked on my color wheel a bit today. This morning I took my usual walk in the East Bay hills, but today I was captured by “all the greens” and other colors and tried to figure out how I might duplicate the color when painting. There was a wonderful compassionate, caring, non-threatening excitement to the whole tone of the weekend that allowed all of us to take risks and experiment and feel safe. You are an inspiration and I will look forward to another opportunity to take class with you.